What colour light flashes under the siren? It is a blue light that is emitted from the base of the siren box when the alarm is sounded. What type of batteries are included in the kit and where can I obtain these? Included in the kit are 6 x AAA, 2 x CR2032, 4 x D Cell. These will last between 18-24 months. All these battery's are available from all good supermarkets. Whilst setting up and testing this alarm, if the siren goes off can it be switched off immediately via the app or keypad? I see a question above that mentions the siren goes off for 10 mins. When the alarm is activated you can de-activate it immediately with your mobile, keypad or keyfob. With SR-320 alarm if the hub was in the bedroom with my router why would I want 94DB going off. Can this internal alarm be switched off or is the system only activated when out of the property? The internal Siren would only sound once the alarm has been triggered. You can disable the alarm at any point when at home and fully activate it when you leave. You also have the option of Part Arming your property. With the two year warranty, are all parts replaced if they become faulty? All parts are covered with the two year warranty and will be replaced by Yale if they become faulty. Ive not got internet at the property yet (newbuild) will the alarm still be able to function? The alarm would still function without internet as it would work as a standard alarm but you won't be able to control the system via the Yale App or receive notifications until your broadband is connected. Will the Yale Smart Living App work on my Iphone 4S it has IOS 9.3 but the app store says it will not work on this Iphone. The Correct App is the Yale Home System App, which should be compatible for IOS 9.3. I have a Yale HSA6090 non telecoms unit would I be able to use the door sensors and room sensors with this unit as extras? The HSA6090 alarm works on a different frequency. I am afraid that none of it's components are compatible with the SR range of Yale alarms. Is it possible to buy the Yale Smart Home Alarm Kit SR-320 with a dummy siren (which comes with the Yale Smart Home Alarm & View Kit SR-330 but seemingly not this one)? Dummy sirens are not available to purchase as accessories for the alarm kits. 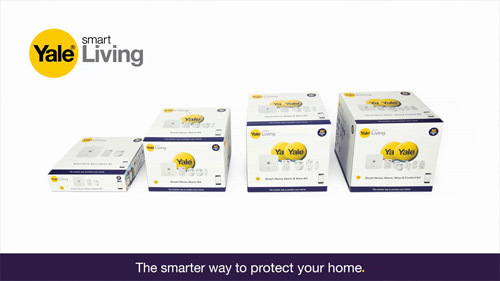 As they systems are set packs you would need to purchase a system such as the Yale Smart Home Alarm & View Kit - SR-330 which includes the dummy siren also. Is this alarm system grade 2 EN50131 or above? The Yale Smart Home Alarm Kit-SR-320 is not grade 2 EN50131 approved. I am not sure what an Ethernet cable is. Do you supply one with your YL-SR-320 kit or would it have to be bought separately and where would I get one from? Everything you need to set up the alarm system comes together in one box, including the Ethernet cable. An Ethernet cable carries the broadband signal between wired capable internet devices and is used in this instance to connect the 'Smart Hub' to your broadband router. Can the alarm be set if your internet wifi has gone down? Yes the alarm could still be set or de-activated using the main control keypad. Does the Yale Smart Alarm SR320 work with an ipad? Yes this alarm system can be accessible through the Yale app on a Apple iPad or any Apple device. Can you use your own sim card like a cheap GiffGaff one or does Yale control the sim card with its own contract? I cant see any thing about the sim in the install instructions. A standard pay as you go sim card can be used in the alarm from any network other than the network Three. Are there any Yale WiFi cameras that are compatible with this Yale system? I know you can buy the PIR Camera but I'd like a more versatile camera that can pan, tilt etc and be linked to and viewed in the app. I've seen some Yale cameras but they require a different app (I'd like everything in one app). The only cameras that can be linked as part of the alarm system or on the same app are the PIR versions. Cameras such as the Yale Smart Living Wi-Fi Camera with Pan, Tilt & Zoom have their own smartphone app. Does it have to be professionally fitted?? These systems are designed for self installation. With no wiring required, you do not need to hire an electrician for installation. 1) Can the smart hub be connected via wifi to the router or is the ethernet connection required permanently between router and smart hub? 2) I have a HUDL tablet running Android version 5.1 could this be used to control set up of the smart system? The hub is connected to a the internet router by ethernet cable only. The app needs Android version 4.2 or above to work with the system. For a home with two distinct outdoor areas where a deterrent from a live siren box is desired on both parts of the building, does the system support 2 siren boxes triggered at the same time ? Yes the system does support two sirens. However, we do not sell these separately. If I’m out, how quickly will the alarm notify me of its activation and send a picture from the camera PIR - assuming a good internet connection? If the alarm is on partial setting, will it go off immediately in the event of a PIR trigger, or will it allow 30s to disarm? If the alarm has already been triggered by e.g. a window contact, will the camera PIR still take a photo if the intruder subsequently triggers this too? Finally, if I have a connected smoke alarm, will the external siren sound when I burn the toast? When the alarm is triggered you will receive notification immediately, dependant on internet connection. You can set an entry/exit time on the system which means you will have a set period in which to disarm the alarm once a sensor has detected the entry. The Image Camera will take an image once it has detected motion and the Smoke Detector will sound when it detects smoke. If I add the smoke detectors do these need to be on a separate zone, is possible to turn them off i.e. by accident? The smoke detectors do not need to be on a separate zone and can be added onto any zone, which you set via the Yale App. The smoke detector can be turned offer via the Yale App also. I would like to buy the YL-SR-320 kit, can it be supplied with the dog friendly PIR's? And if so where do I make this request? Yes the Pet Friendly PIR's and other sensors can be selected from the accessories section at the point of order. Is it possible to set the internal hub so that it doesn’t sound, and only external siren sounds? Unfortunately the alarm in the hub would always sound when the alarm is triggered. Is this compatible with the Nest camera systems? Unfortunately this is not compatible with Nest at the moment. So if this system sends notifications if the alarm goes off, what happens if somebody trips the power? I read the hub has a battery but if my router is offline due to no power. How does it notify me? If there is no power to the router the siren would sound, however the system would not be able to notify you. An alternative would the ERA Invincible - Wireless SmartPhone Alarm PLUS. This model also has an internal battery should power fail, but does not require a internet connection to contact you. This alarm is connected to a landline or a SIM card and will call you if the alarm is triggered.